The Kuipers Family Farm is the ideal location to spend a fall day on a picturesque Midwest farm, with fun and educational features and highlights, including the joyful and carefree jumping pillow, great fun for kids of all ages. Whether you are planning a group field trip or a family day out into the fresh air to pick some apples, get your Halloween pumpkin, take a hayride, feel the fall air in your air on the jumping pillow, or coming back in December for your Christmas tree, you will feel welcomed at Kuipers Family Farm in Maple Park, Illinois. Call 815-827-5200 to speak with one of our knowledgeable representatives about the planning a day of Midwest fun at Kuipers Family Farm. Wander through our vast pumpkin patch, take your time and pick the perfect pumpkin from September 15 – October 30, or load up a quarter peck bag with apples you and your family pick. 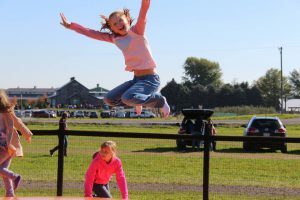 Or simply explore the farm at your leisure, enjoy the fresh air, and all of the features on Kuipers Family Farm, including the fun and high flying jumping pillow.